When I was a kid, my mom used to take me and my brothers to this crappy little lake outside of Atlanta. It had a beach, a dock you could swim to if you weren’t scared of the giant catfish, and a water slide that was a lawsuit waiting to happen. I loved it. We’d go three times a week, and every time I’d get a box of Lemonheads from the concession stand to eat on the way home, while I stared out the window of the station wagon wishing I was doing something more “rad,” like, I don’t know, riding BMX bikes like in the movie Rad. Humboldt Brewing’s new 500 BC takes me back to those days of Lemonheads. Let me explain. To create 500 BC, Humboldt took their already tasty Nectar IPA, then doubled the hops and the alcohol by volume to create, literally, a Double IPA. The beer pours a golden red and smells vaguely floral and citrusy, they way you’d expect a supercharged IPA to smell, but take a sip and you might be surprised by the beer’s initial subtlety. It has a pleasant, slightly sweet, malt backbone and a creamy mouth feel that you might not associate with this beer style. You probably won’t even realize you’re drinking a Double IPA until you finish the first sip. That’s when the punch of hops kicks in. Wait a beat and let your mouth pucker around an incredibly citrusy hop bitterness that actually builds as the sip vanishes, making your mouth water long after the beer has settled. It’s like sucking on a Lemonhead, and it’s awesome. Founded in 1987, Humboldt was most famous for its hemp ale, which uses toasted hemp seeds. They won the Gold for Mid Sized Brewery at the 2003 Great American Beer Festival, then moved their brewing to Firestone Walker after hitting a rough patch. The brewery was eventually bought outright by Firestone Walker, who changed the brewery’s name to Nectar Ales and introduced Black Xantus, a seasonal imperial stout, to the lineup. In 2012, Nectar Ales was bought by Total Beverage Solutions, and the name was changed back to Humboldt Brewing Company late in 2013. But the beer is still brewed at Firestone Walker. Confusing, yes. But the only thing that matters is that the beer is good. 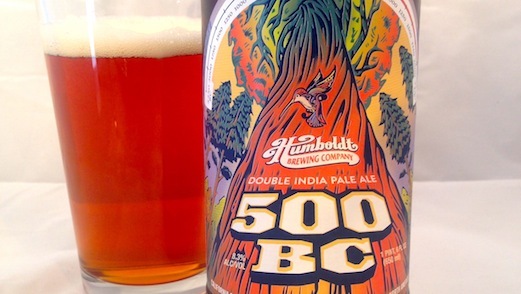 500 BC is a great coming out party for the new/old Humboldt Brewing Company. For me, its zesty lemon character takes me on a nostalgic journey back to the Atlanta suburbs circa ’83. For you, it’s probably just a really great example of a Double IPA. The way I see it, we’re both winners.